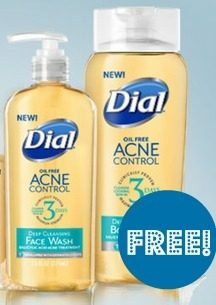 FREE Sample of Dial Acne Control Face and Body Wash! You are here: Home / FREEbies / FREE Sample of Dial Acne Control Face and Body Wash! We have a possible FREEbie for you this afternoon without having to leave your house! Visit the Target Sample Spot, click on “Request Sample” and enter your zip code to see if you are eligible for a FREE Sample of Dial Acne Control Face and Body Wash.